Back in 1977 a random little character appeared on a kids' TV art show. Take Hart, presented by Tony Hart was an art show for kids. Tony Hart would demonstrate art and craft projects that kids at home could copy. There was also a gallery section showing kids' own drawings. For someone with my total and utter inability at anything artful this was visual torture. All that artistic talent and I could do none of it. The highlight of the shows were Morph, a tiny plasticine character that moved about and got up to mischief. Morph, and his partner Chas, were eventually given their own series in 1980. They also continued to appear on other TV art shows, Hartbeat and SmArt. There was a return series in 1995. Despite never being a permanent fixture on TV, Morph has been around a fair bit and is indirectly responsible for some great British animation. 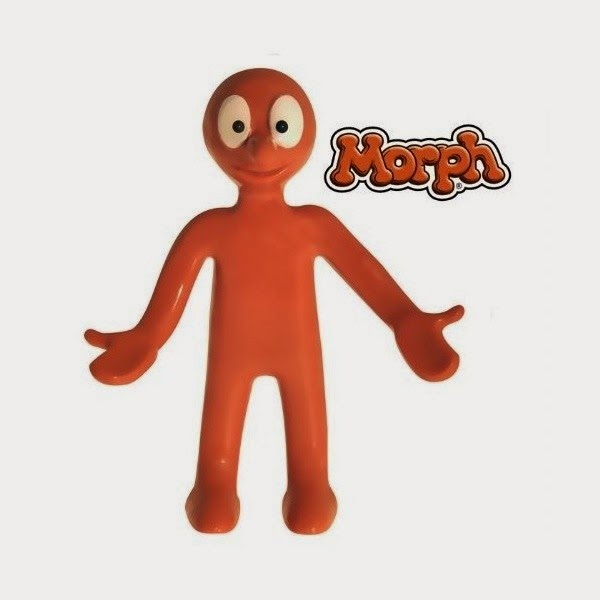 Morph was originally created by Peter Lord and David Sproxton who went on to form Aardman Animations. By 1985 Aardman were quite successful and amongst their staff was new recruit Nick Park. Park went on to create Wallace and Gromit shorts and feature film. W&G has also spawned spin offs Shaun The Sheep, which in turn had its own spin off, Timmy Time. Other Aardman successes include Creature Comforts and the film Chicken Run. A Kickstarter appeal by Peter Lord in 2013 raised over £100,000 funding new episodes being made and broadcast online. A new episode and an old one below.